Get all the Persona Dancing games with the Endless Night Collection. Persona 3: Dancing in Moonlight and Persona 5: Dancing in Starlight will launch physically and digitally for PlayStation 4 and digitally for PS Vita on December 4 in the Americas and Europe, publisher Atlus announced. 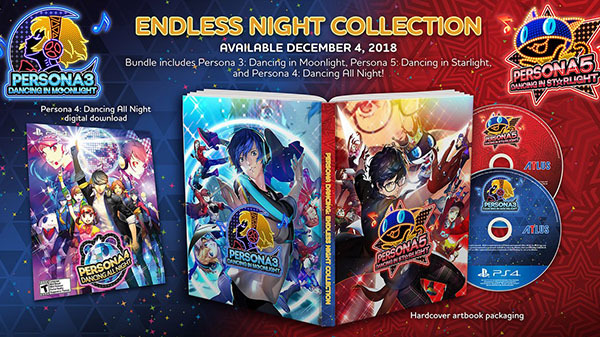 In addition to the standard edition ($59.99 on PlayStation 4, $39.99 on PS Vita), an “Endless Night Collection” including both Persona 3: Dancing in Moonlight and Persona 5: Dancing in Starlight, as well as a digital download for Persona 4: Dancing All Night, will also be released physically and digitally for $99.99 on PlayStation 4 and digitally for $69.99 on PS Vita. Watch a new set of trailers below.